This week, it was reported that the demand for new caregivers at assisted living communities is at an all-time high due to current staff shortages. As a result of a combination of extraordinary responsibility and a long list of duties, these resident communities are facing a lot of staffing changes and caregiver turnover. This revolving door of caretakers not only is concerning to residents, but hinders community efficiency and workflow. A lighter work force means that other employees need to pick up the slack and new personnel require training and onboarding to acclimate to their new responsibilities and daily tasks. Many long-term care communities are turning to technology to help relieve their staff of some of the added responsibilities and to increase overall campus visibility. 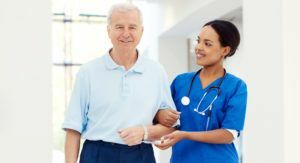 Implementing a resident safety and security platform that utilizes a Real-Time Location System (RTLS) is helping to fix these operational workflow issues and allows staff to focus primarily on interacting with and caring for their residents. Sanctuary Care at Rye™, a 56-bed assisted living community that focuses on residents with mild to moderate cognitive impairment and memory loss, found that this combination resident safety/security and real-time visibility solution helped them see a significant improvement with staff effectiveness. Without a change in the number of caregivers on premises, their staff was able to accomplish more every day because they were not concerned with wasting time doing things such as searching the facility for a specific resident or worrying if specific residents were wandering into restricted areas. One of the highest stress factors that assisted living community caretakers face is the potential that their residents will wander into dangerous areas. By implementing a community-wide resident safety and security system, residents can feel empowered with a sense of control and freedom to safely access certain community amenities and common areas while being fully secured and protected from high risk zones. This freedom has the potential to improve resident satisfaction, making their encounters with staff much more pleasant and positive. Additionally, managing care schedules is simple and efficient due to staff knowledge of the residents’ precise location. Choosing a resident security solution with clinical-grade visibility capabilities provides staff with a quick response to wandering and significantly reduces risk of resident hazards. Wandering residents can be respectfully redirected before traveling too far out of bounds, avoiding awkward encounters and dangerous situations. To keep employee satisfaction high, it’s critical that they never feel distracted or concerned about their personal safety in the workplace. Automated staff duress and panic alerting systems enables immediate response times during emergency situations by instantly locating the specific employee under duress. Each staff member is provided with a RTLS badge featuring wireless call functionality. Assistance is only a simple button-press or pull-cord away and provides resident caretakers with the peace of mind that they are always safe and protected. To learn more about how your assisted living community can increase staff satisfaction operational workflow efficiencies, download our Long-Term Care Resident Security and our Staff Duress & Panic Alerting overviews.